LC Tri-State Laundry Companies is proud to showcase our latest installation at United Hospitality Services, LLC in Atlanta, GA featuring a Milnor (150lb) Twelve Module PulseFlow Tunnel Washer with 50 Bar Single Stage Press and 6 (Six) 320 lb Automated Pass-Through Dryers. 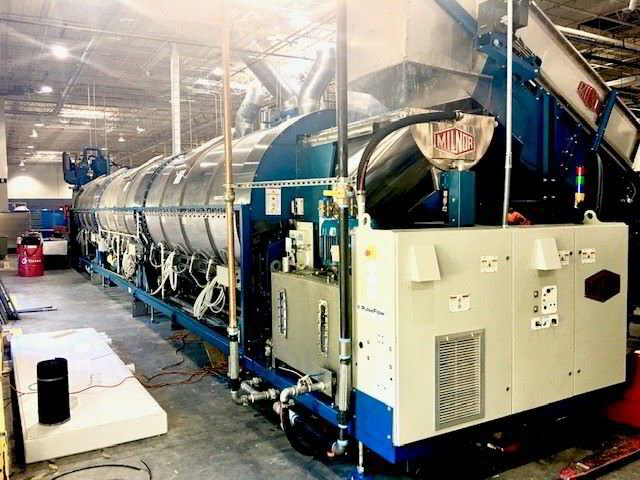 This Continuous Batch Washer processes up to 5000 lbs of Hospitality Linen Per Hour and provides our customer with significant water and energy savings while maintaining excellent soil removal and linen quality. This technology leads the world in water conservation at only 0.3-0.42 Gallons of Water (per pound) of linen produced. Great Job Bob Halpin and the entire TLC Tri-State installation team!